My family and I have been on a trip out in California the last few days. On our drive from Modesto to San Francisco we’ve seen a lot more solar water and pool heating systems than we have solar electric. This is a bit of a surprise, but we’re thrilled! In the family of solar energy systems, water heating is a bit like the younger Cinderella, doing most of the work but getting the least recognition. 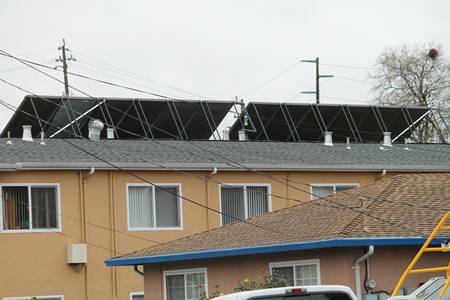 This photo is of domestic hot water solar collectors on an apartment building in Pleasant Hill California. What a great way to increase the profitability of an apartment building! Nothing says “we plan ahead” like a solar domestic water heating system.